Ah, Valentine’s Day….the day of love. And, perhaps a day of eating delicious sweets? We ran into a great recipe that is festive, light, and decadent at the same time. Beat together egg whites, salt, cream of tartar and vanilla until soft peaks form. Add sugar gradually beating until peaks are stiff. Fold in the 6 oz of mini chocolate chips and the almonds. Scoop the meringue into a gallon sized Ziploc freezer bag. Seal it, then cut a 1/2 inch opening across a lower corner of the bag. 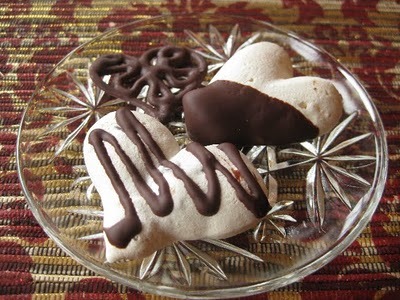 Use it like a pastry bag to pipe meringue hearts onto parchment paper lined baking sheets. To form the hearts, hold the pastry bag from the top with one hand. Position the open tip of the bag near the parchment paper, but not touching it. Gently squeeze the bag with the other hand forming a round dollop of the meringue on the parchment. Now relax the pressure on the bag as you draw it toward yourself forming the first half of the heart. Lift the pastry bag away from the parchment paper and reposition the tip a small distance away from the first dollop of meringue. Form another dollop and draw the bag toward the bottom of the first dollop while relaxing the pressure on the bag. The meringue should form into a rough heart shape or a sort of V. Repeat until heart shaped dollops of meringue cover the cookie sheet. Bake at 300 degrees for about 20 minutes or until set and beginning to brown slightly. Remove from oven and allow to cool on a wire rack. When cool, dip the lower half of each cookie in melted chocolate allowing the excess to drip back into the pan before placing the dipped cookie on a parchment lined cookie sheet to set. When the cookie sheet is full, place it in the refrigerator for a few minutes until the chocolate is firm.